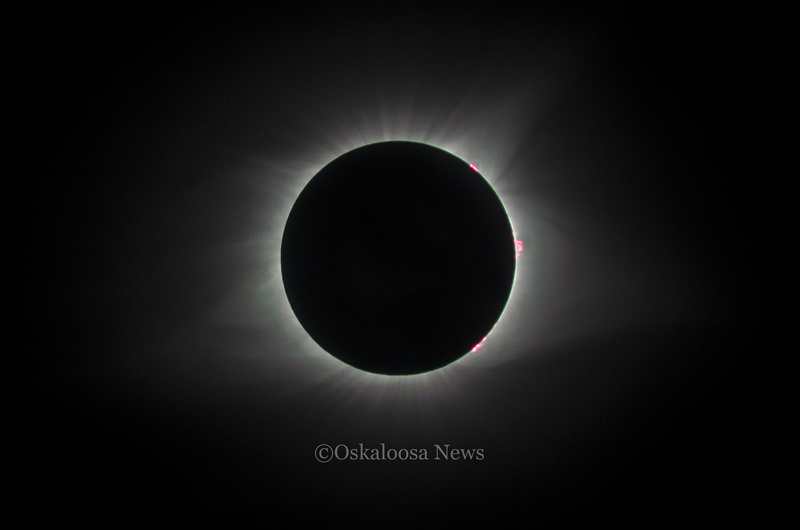 Saint Clair, Missouri – It had been dubbed the ‘Great American Eclipse, and for a few hours on Monday, the nation turned its attention to the sky, while a rare astronomical event played out before them. In Oskaloosa, Iowa, people gathered in small groups to watch the eclipse, predicted to be at 94% totality. That much eclipse could make it look like early evening light, and the shadows cast through the trees were crescent in shape as the moon continued to block the sun. 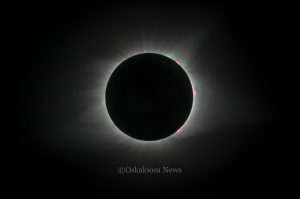 Along the lines of totality, communities like Saint Clair braced for the rush of people that wanted to view totality, and the city was positioned in the center of the projected totality. The Assembly of God Church in Saint Clair had a unique opportunity to share their 10 acres of land with the mass of people squeezing into the space. Twenty dollars got eclipse viewers a place to park, an air conditioned building and a warm host of volunteers to make the experience special. As the eclipse started, people would put on their eclipse glasses to watch as the moon overtook the sun. As the moment of totality arrived, the nearly silent crowd then came alive with shouts of awe and happiness as the sky darkened. At that moment, the Sun’s corona, which is made up of plasma that surrounds the sun, became visible. For over two minutes, people stared at the spectacle without their eclipse glasses, taking in the once in a lifetime view. As the moon continued to move, the sun became more visible, and totality came to an end. Fireworks could be seen and heard as people celebrated what they had just witnessed. Gene Bernard and his wife Cheryl arrived at Saint Clair with “Totality or Bust” written on the glass of their vehicle. Gene said that he was looking for a good place to watch the eclipse and noticed that the St. Clair community, and in particular the church parking lot, were on the centerline of the event. “It was awesome,” said Cheryl. The 300 mile trip from northwest Indiana view the event was all for that one moment. “Unbelievable” added Gene of the experience. The couple plans to make the trip in 2024 for the next total eclipse that will make its way across the United States. “We’ll be there,” said Cheryl. Jeana Sleet was one of the many volunteers at the church parking lot that worked very hard to make their visitors feel welcome. “It was phenomenal, and I got to experience it with all these people from all over,” added Sleet. “It’s awesome we all got to experience it together,” added Sleet. Posted by Ken Allsup on Aug 23 2017. Filed under Local News, National News. You can follow any responses to this entry through the RSS 2.0. Both comments and pings are currently closed.